The southwest face of Challenger Glacier on Challenger Mountain in North Cascades National Park, as seen November 20, 2003. John Scurlock says this is one of his favorite glaciers. Mountains loom large in the Skagit River Valley. Visitors come from all over the world to spend time exploring the massive peaks of the North Cascades. But few people get the perspective on them enjoyed by two men who are documenting the response of Washington’s glaciers to climate change. Jon Riedel is a geologist with the U.S. National Park Service. And John Scurlock is a photographer and pilot who works with scientists like Riedel. 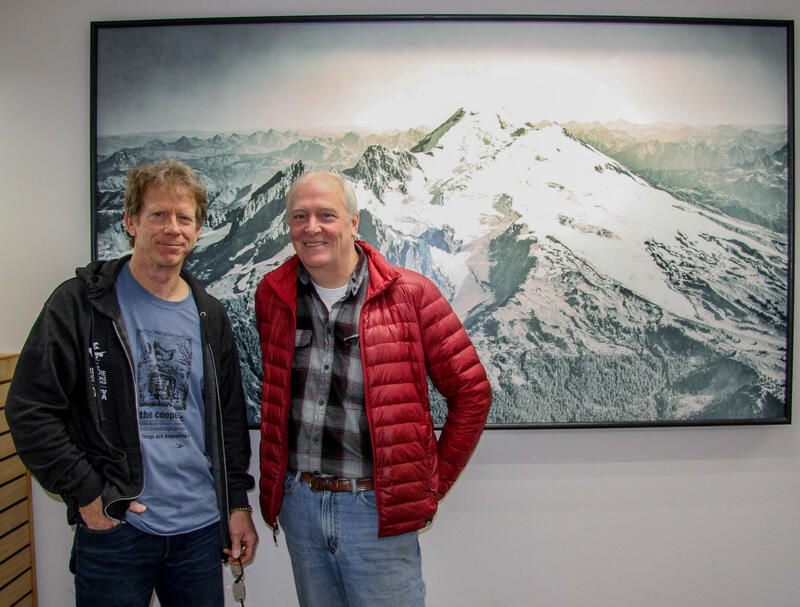 Aerial photographer John Scurlock (L) and Parks Service Geologist John Riedel have become friends as they've collaborated in documenting the effects of climate change on Washington's glaciers. Scurlock has just finished capturing aerial images of all of the glaciers in the Lower 48. But he admits that collaborating with scientists wasn’t his main objective when he got started 17 years ago. “I’m fortunate that what I have done combines my three obsessions: namely flying, photography and mountainous terrain,” said Scurlock, who previously worked as a paramedic. But he had a lifelong dream of becoming a pilot. “And I built my airplane from a kit. It sounds crazy but it’s really not – trust me,” he said, with a chuckle. He has a house near Mount Baker in Concrete, so he says it was natural that he started out taking lots of flights around it in his little plane, and taking lots of photos. And that rather quickly put him in touch with scientists interested in the images. Among those was Riedel, who monitors glaciers at eight sites in the three national parks of Washington state, measuring them up to three times a year to track their mass and coverage areas. “We monitor glaciers seasonally for changes in winter accumulation and summer melt. And then we’re able to add or subtract the value from year-to-year trend in the change in volume of these glaciers,” Riedel said. In addition to field visits to specific sites where measurements are taken each time, park service scientists also track all of the glaciers in the national parks using aerial photography. Scurlock has contributed quite a bit to that effort. “What we’re seeing with the glaciers is a pretty pronounced decrease in their volume that’s being driven mainly by warmer and longer summers,” Riedel said. “They’re super sensitive to air temperature because not only does it affect how fast they melt in the summer, but it also determines whether they get rained on or snowed upon in the spring and the fall. "And so the glaciers are sort of getting this double whammy, where the amount of snowfall is decreasing — and summer melting is increasing. So we see in North Cascades and Olympic National Park 50, 52, 53 percent loss in glacier area in the last century,” he said. * Data courtesy of Jon Riedel. Scurlock says what he sees from the air consistently confirms those statistics. Other than that, he says he sees evidence of glaciers receding — including his images of the Coleman Glacier in the Mount Baker Wilderness. Over just a 12-year span, from July 2003 to September 2015, the area it covers appears to have receded by half. And Scurlock says in cases where he is flying over a glacier for the first time, he often sees them covering a dramatically smaller footprint than what is shown on charts and maps. While pairs of images can show us a lot, the loss of glacier mass is not just about aesthetics. Riedel recently gave a presentation to water managers in the Skagit River Valley. When he showed them the visual evidence, a collective gasp echoed through the room. Riedel says, especially for his hometown watershed, the cool glacial flow has shaped entire ecosystems. “The amount of glacial water in the Skagit in summer is somewhere between 6 and 12 percent. And so that provides what we call the buffering capacity, or insurance for our summer draught or for longer term draught, for species that inhabit the Skagit River,” Riedel said. “And so really what we have in the Skagit River Valley is a little piece of Alaska here, where we have fairly extensive glaciers, a large amount of glacial meltwater that suppresses the summer river temperature and provides water even after the snowmelt has long since melted away,” he said. And scientists have found that that consistent, stable source of cool water is one of the reasons why all five native species of salmon return to the Skagit River each year to spawn and reproduce. The most powerful pairs of images tend to be the ones showing the greatest time span. So a big part of Scurlock’s work involves receiving historical images and then figuring out how to fly out and recreate the shot. He’s says it’s challenging — not just getting to the right spot in the sky. “Once you’re there taking the photograph, there are so many variables that can affect your ability to put the plane in exactly that same position. It could be windy, maybe the sun is different,” he said. He’s come to realize that the best way to handle that is by blanketing the glaciers with photographs, on the assumption that one or a few of them will come out approximately right. Riedel says Scurlock is known as one of the best. He has commissioned photographs from him since about 2005. “And he re-photographed a number of the glaciers for me in 2016. And directly compared them to this incredible historic photo set taken by Austin Post, who was a geologist-pilot who worked for the U.S. Geological Survey,” Riedel said. Those historical images mostly come from the late 1950s and early '60s. Riedel says Scurlock has done a remarkable job re-photographing. “The paired images are stunning because in many cases the glaciers have disappeared completely," Riedel said. "We have photos from the Olympic Mountains where the glaciers are gone. And in other cases the change is so dramatic, you see huge loose fields of rubble that used to be covered by ice, 50 or a hundred years ago. To see more of John Scurlock’s photography, check out these videos: “Three Minutes of Washington” and “Eldorado Peak.” Read about Scurlock here, and learn more about his book. All Things Considered host Ed Ronco and producer Geoffrey Redick discuss food commentator Nancy Leson's visit to Skagit's Bread Lab. MOUNT VERNON, WASH. — When the Bread Lab was founded eight years ago, it was just that — a lab inside Washington State University’s Mount Vernon Research Center. Now, it lives in a gigantic building full of ovens and flour mills, where bundled wheat stalks adorn the walls. Food commentator Nancy Leson visited (and indulged her way through) the Bread Lab recently. All Things Considered host Ed Ronco takes a tour of Mount Vernon with Mayor Jill Boudreau. Jill Boudreau has been mayor of Mount Vernon since 2012. 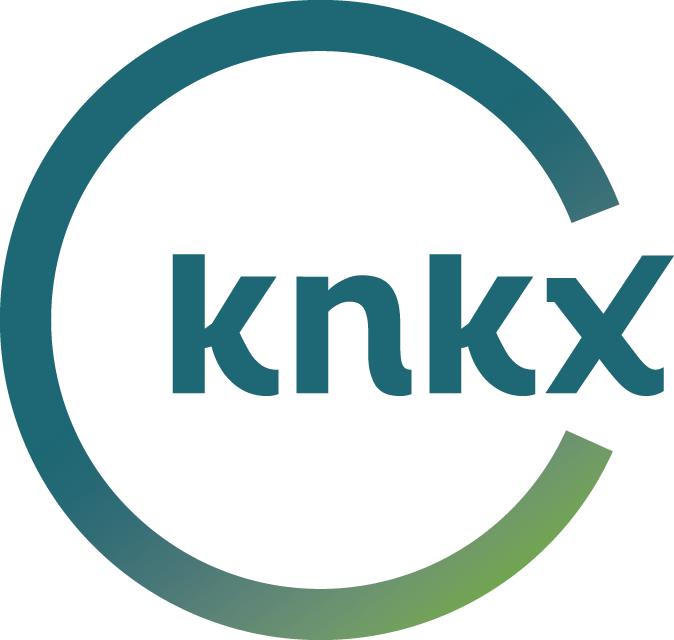 As KNKX Connects to the Skagit Valley, Boudreau takes KNKX All Things Considered host Ed Ronco on a walk through the city’s downtown. Matt Malyon is a chaplain and a writer who spends nearly every Wednesday afternoon with kids wearing orange jumpsuits. They meet in the Skagit County Juvenile Detention Center, where they read poems and song lyrics together. And, they write together. The program is called Underground Writing. It started in 2015, but has since expanded. They have a podcast, a new book and workshops in five Skagit County locations. It appears a pattern of heavy storms in the Pacific Northwest may have obscured the effects of climate change over the past 20 years. Researchers here have identified a southern shift in the jet stream as a source of heavy precipitation that built up snow pack and glacier mass in Washington and Oregon, while they were declining elsewhere. Mount Rainier is famous as the most glaciated peak in the contiguous United States. But the massive flows of ice and snow that cover the mountain are retreating rapidly, likely more rapidly than ever in the record warmth of this summer. Participants in the 2015 "Climate Boot Camp" put on by the Northwest Climate Science Center gathered this week in Mount Rainier National Park to learn more about the dynamics behind this phenomenon.